As a preface, I like classic tool watches. My first Rolex was a Submariner (ND) in 2007. In 2008, I purchased a Speedmaster, then in 2011 I bought what I thought would be my last watch purchase, the 39mm Explorer. And then the new GMT "Bruiser" came out and it really made me look at the more modern designed Rolexes. I was fortunate enough to have tried on the blue at an AD, and while I think it is a beautiful watch and understand the technical achievement of the bezel, the all black is just more my style. 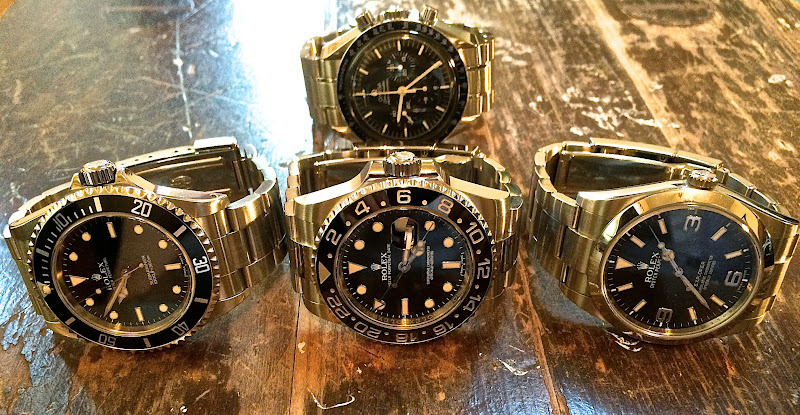 I love my Submariner, but I wore the Explorer and Speedmaster more because I found the bracelets more comfortable. But wearing the Explorer, I missed the look of the coin edged bezel. And I don't own a watch with a date, and while I was never particularly enamored with the cyclops lens, it is a Rolex hallmark and now I find I really do not mind it at all. And so, taking all this into consideration, the GMT2-C seemed like the perfect way to celebrate 40 years on planet Earth. If I want "classic" Rolex, the Sub has me covered. If I want subdued/stealth, the Explorer is it. And if I want to just celebrate all that is modern Rolex--the GMT really does it quite well.